Mie imi plac paletele de la Sleek…sunt foarte bune , au o intensitate a culorilor excelenta iar de pret nici nu va mai spun…..extra decent (45,47 Ron) pe Makeup-shop.ro sau in magazinele Kendra! I really love the Sleek Palettes…they are very qualitative,the colors are so powerful and intense and I don’t have to say anything about the priceee…so small(10,06€) you can find it on Makeup-shop.ro or in Kendra Stores! Aceasta paleta contine 12 farduri sidefate , foarte pigmentate dar in acelasi timp se blenduiesc foarte frumos…fara prea mare greutate. 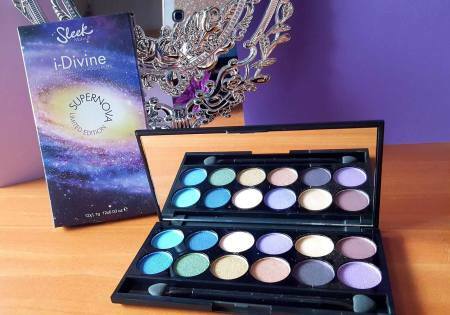 The palette contains 12 shimmery eye-shadows, very pigmented but in the same time easy to blend. Am ales aceasta paleta datorita nuantelor….m-au atras culorile acestei palete….sunt 4 nuante de mov….de la deschis la inchis…..3 nuante de bej sidefat (perfect pentru iluminat) si un auriu superb, o nuanta de verde si trei de albastru 🙂 Just gorgeous! I chose it for this gorgeous shades….there are 4 purple shades…from light to dark, 3 pearl bej (great for highlights) and a golden one, a green one and 3 blue shades 🙂 Just gorgeous! These colours are just gorgeous, so pretty :0 lovely post! I’m really enjoying reading through your blog x considering the types of things you blog about I think you might just like my blog too, if you get a chance why not take a peak? Love this ! So pretty !